Karl Plättner was born into a poor working class family in Opperode on 3rd January1893 in Ballenstedt, in the Duchy of Anhalt, Germany. He received an education up to elementary level and then took a craft apprenticeship in an ironworks and worked as a moulder at Thale am Harz, where the family had moved. He began to develop rebellious attitudes in his youth and came into conflict with the authorities, being arrested for “insulting behaviour”. At the end of his apprenticeship he wandered through Germany for a year and in 1910 settled in Hamburg. Here he joined the Metalworkers Federation and the Social Democratic Party (SPD) in 1911 and by 1912 was a leading light in its Youth League and a member of the State Executive Committee, and a district manager of the Party in 1913, belonging to its left. Plättner was disgusted by the attitude of the SPD to the war and its support for war credits. He later called the day that the SPD voted for war loans –August 4th 1914-“the most shameful day in the history of social democracy” and “an immense betrayal of the idea of socialism”. He was conscripted into the Army in September 1914 and was injured in battle on the Western Front in 1915, suffering three crippled fingers. He was released from the Army in late 1915 as unfit for combat. His injuries meant that he was no longer able to work as a moulder. He then worked as a clerical assistant at the Allgemeine Ortskrankenkasse (health insurance) until 1917. He was by now a staunch opponent of the war and began to organise within the oppositional currents of the SPD among workers and the illegal youth movement. The Hamburg police chief called him “the soul of the radical youth movement”. He attended the Berlin conference of the oppositional SPD Youth in Easter of that year and with Karl Becker and Reinhold Schoenlank was elected to the committee that drafted the guiding principles of the youth organisation. He edited the oppositional paper Proletarier-Jugend (Proletarian Youth) and organised meetings of the SPD youth in northern Germany. In September he was arrested at a secret meeting in Hamburg for having distributed a leaflet about the arrest of Liebknecht. He was due to be tried in October 1918 but the German Revolution of November 1918 led to his liberation. He was then a co-founder of the Dresden branch of the International Communists of Germany (IKD). He was temporarily a member of the Dresden Soldiers and Workers Council, but resigned from its committee on the 16th November together with other IKD members because of his disagreements with the SPD mainstream majority. Together with Minna Naumann and Karl Becker he acted as an IKD delegate at the founding conference of the Communist Party of Germany (KPD)-Spartacus League in late 1918 in Berlin. In January 1919 he became chairman of the eastern region of the KPD. When the Bremen Soviet Republic was declared on 10th January 1919 he was a member of the Workers and Soldiers Council but did not serve on the governing body of the Republic. At this point he began to indulge in fiery rhetoric, demanding that for every Spartacist shot, a Bremen SPD leader should be executed. This isolated him from the mainstream of the KPD. With the crushing of the Bremen Soviet Republic on 4th February 1919 he fled to Berlin. There in March 1919 he took part in the armed actions. He was arrested in Halle in September and was in prison up to early December but managed to escape. He then gave meetings as a KPD agitator in Saxony-Anhalt. After the Kapp Putsch he took part in the fighting in the Ruhr. In April 1920 he was one of the founding members of the Communist Workers’ Party of Germany (KAPD), bringing the majority of the KPD branch in Magdeburg with him. He became a leading light in the Bremen KAPD and a leader of the KAPD armed detachments and took part in the March Actions in 1921 in central Germany, alongside Max Hoelz. With the arrest of Hoelz in mid-April Plättner came out from under his shadow. He began to undertake armed raids under the slogan “Expropriate the Expropriators”. He felt that both the KPD and the KAPD had failed the working class and produced a pamphlet entitled Organised Red Terror. He urged workers to take direct action, to undertake a permanent guerrilla war: "You have no weapons, yet you have matches -, buys matches and set the villas of the wealthy on fire, also bring dynamite and let no stone upon another, because this world is beyond redemption. " He recruited the core of his group, 13 men and 2 women-in Berlin from ordinary workers disillusioned with the politics of the SPD. His groups organised bank raids, armed with revolvers and grenades. Nevertheless they were pledged to avoid violence to people at all costs, One raid in June amassed almost 250,000 marks and another in October 1921 resulted in 100,000 marks being expropriated. The KPD distanced itself from him and these forms of activism, which it called "pronounced Bakuninism". The group members were distributed to various prisons. Plättner himself started his sentence at Brandenburg prison. He became a thorn in the side of prison authorities, bombarding them with complaints on prison conditions. In September 1925 he was moved to the Moabit prison in Berlin. In March 1926 he issued a statement saying that any attempt to continue with the sort of tactics he had used was just “romantic disguised crime” and that "My conscience and my sense of responsibility towards the idea of purity of communism enjoin me to put an end to this deviltry." 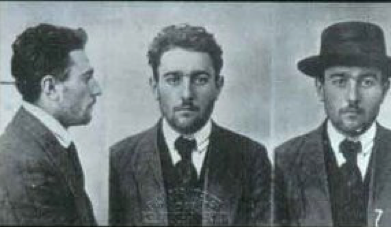 Plättner was moved to Luckau prison,and amnestied in July 1928. A large crowd of workers greeted him at Leipzig station. He now returned to the orbit of the KPD, but without re-joinng it. He worked in Leipzig for the Rote Hilfe (Red Aid) which undertook solidarity with class war prisoners. At the end of 1928 he brought out a booklet on the prison system. In late 1929 his book Eros im Zuchthaus ( Eros in prison) was published which addressed the up to then taboo subjects of masturbation and homosexuality in prison. He then undertook a lecture tour on the subjects addressed in the book. Friedrich Lichtneker , author and playwright at the National Theatre in Vienna wrote a play based on the book. In 1930 he brought out his memoirs. Plättner was disgusted by the politics of Stalinism and began to withdraw from politics.He was now a merchant of firewood. The rise to power of the Nazis in 1933 led to him being detained by the Gestapo in June 1933. In 1937 he was in the Sachsenburg prison camp in Chemnitz for several months. On 1 September 1939, with the beginning of World War II, he was arrested again and put in Buchenwald once more. The eternal rebel that he was led him into confrontations not only with the with the SS guards, but also with the KPD officials in the camp, "the red Kapos". At the end of January 1944, he was transferred to the extermination camp of Majdanek. In July of the same year he was transferred to Auschwitz, and in early 1945 was forced on a death march to a sub-camp of Auschwitz at Melk. He was finally liberated by American troops on 6th May troops from another sub-camp of Auschwitz at Ebensee. Immediately he made a move to return to Leipzig. However the awful treatment he had received in the camps led to him being hospitalised en route in Freising. He died on June 4, 1945 and was buried in Freising. In 1959, his remains were reburied in the war cemetery at Nagelberg in Treuchtlingen. In 2000 Volker Ullrich produced a biography of Plättner- Der Ruhelose Rebell (The Restless Rebel): Karl Plättner 1893-1945. (1)	There was also the now even less known Herbert Kobitsch-Meyer born in 1900 who died in Brandenburg prison in murky circumstances on 1st January 1930. He was radicalised by the Russian Revolution when as a sailor he was interned in Siberia. He was in contact with the Plättner armed groups during the March Action and then returned to Hamburg to organise his own group of armed expropriators in 1924. He was imprisoned in 1925.